The wonderful vision and message at this grotto commenced on this Friday evening when some members of the ORourke family came to the Grotto to pray. Having recited the rosary the family started to leave, Ursula taking up the rear. she noticed that our lady was moving. First she thought that it was her imagination, and she looked away several times before she finally realised that she was looking at the Blessed Virgin Mary. A strange feeling came over me which is very hard to describe. Tears came to my eyes, and I pulled my hands up from my sides, joined them and then blessed myself. I said to the lady.You are the Queen of Heaven.She smiled. I kept exclaiming,why me? Why did you pick me, why? She smiled again, and then I said, Please bless all my family. She smiled even more. She did not speak to me during this vision. The Lady described by Ursula stood there, her gown blowing as if in the wind. Her hands were joined in prayer and her head moved in a very slow reverent movement. North, South, East and West, the green shrubbery all around her spun. It formed a very dark green, which made Our Lady shine brightly. Leaving the Grotto I walked, wishing to be respectful and keeping my eyes on Our Lady all the time. 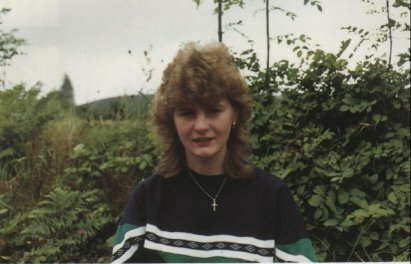 As I came out my sister, Mary was at the gate and I broke down and cried, crossing the road to the car. We all returned to the Grotto. Our Lady was still there but not as clear as the first time. 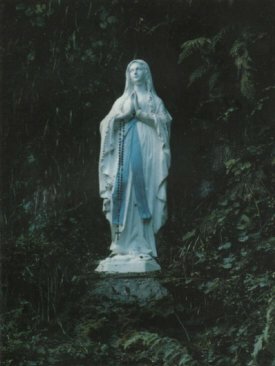 I heard John say, Our Lady of Lourdes pray for us. I knew he could see. Mary was down at the rail shouting Look, Look! Speaking later Ursula said that no words could describe how beautiful Our lady was. She then walked down steps to the edge of the water. “God is angry with the world. The people will have to improve and pray. My message is for all the people of God’s Church. The boys received a vision of the Great Flood and Noah’s Ark. “I love the Irish people. I am praying with the people to God to forgive the Irish people. “You have ways yourselves of spreading my message”. I want the people to accept the message from the children. The people must pray more. The people must go to Mass more and receive My Son more often. I want the people to believe the children. The world has ten years to improve. Tom then received a vision of Doubting Thomas. The Virgin asked several times for the hymn «Peace is Flowing Like a River». I want the people of Ireland to convey My messages to the world. I want Ursula to help you make the people believe. She did turn to the crowd on the road just as She said and many people on the road saw Her then. The Virgin Mary showed the boys the vision of Jesus subduing the storm as if to remind us that God could still turn the catastrophe back overshadowing the world, if we would only turn to Him. Then a vision reminiscent of nativity scenes followed. “I want Ursula to help you to make the world believe. I am happy with the three of you. You must believe and the world must believe. Tom and Barry then had a vision of Virgin Mary, her cloak ripped, holding the infant Jesus in Her arms. Many of the people present claimed they could see this. The world must improve and the world must believe. If the world does not improve the devil will take over the church. The boys were then given a vision of Satan jeering Our Blessed Mother to Her left side. “I want you to pray harder and harder.” This was repeated several times. Each time Our Lady asked for prayer by saying “I want prayer” the people would pray the rosary, after which Our Lady said “Thank you” . Friday marks the end of the apparitions to the two boys. However an additional message was conveyed on Saturday. An older woman asked Tom who was not accompanied by Barry to ask the Virgin if She was the mother of Jesus.